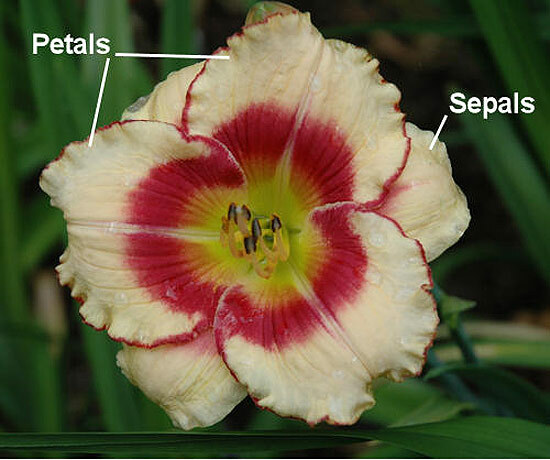 The shape or structure of a daylily flower. The AHS officially recognizes the following forms for registration and exhibition purposes: single, double, spider, unusual form, and polymerous flowers. 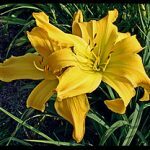 Single — Daylily flowers that have three petals, three sepals, six stamens and one pistil(comprised of three carpels) are known as “single” daylilies. 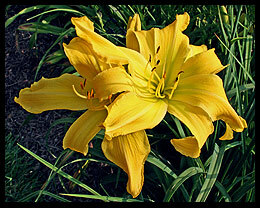 A single daylily flower may occasionally have fewer or more (see “polymerous”) parts per whorl. Also see “monocot”, “double”. 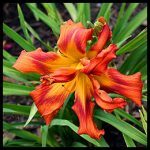 Double — Double daylilies, like single daylilies, come in different forms. 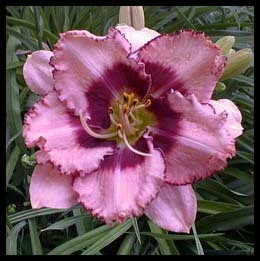 ‘Hose-in-Hose’ doubles have extra whorls (layers) of petals so that there appears to be a flower within a flower. ‘Peony type’ doubles have petaloid (petal-like) stamens inside the normal petal whorl. Carpels may also be petaloid. Unusual Form — A class of daylilies based exclusively on the shapes of the petals or sepals. These shapes include Crispate (pinched, twisted, or quilled), Cascade, and Spatulate. 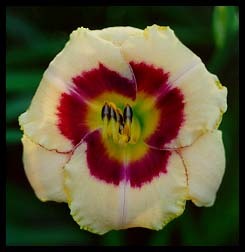 One or more of these shapes must be displayed on at least 3 petals or 3 sepals. 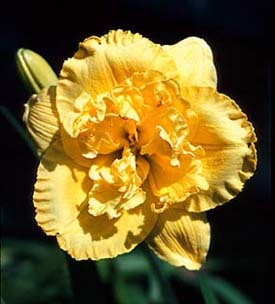 Pinching – Floral segments with sharp folds giving a pinched or folded effect. Twisting – Floral segments which present a corkscrew or pinwheel effect. Quilling – Floral segments turn upon themselves along their length to form a tubular shape. Cascading/Curling – Narrow floral segments with pronounced curling or cascading, which revolve upon themselves in the manner of a wood shaving. 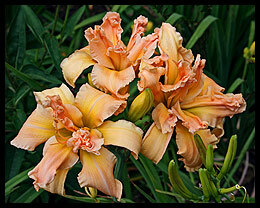 Spatulate – Floral segments markedly wider at the end like a kitchen spatula. 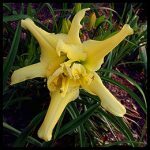 Polymerous — Polymerous is an adjective used to designate a daylily with more than the normal number of segments in each floral whorl, i.e., more than the normal three sepals (usually four or five) in the outer whorl and more than three petals (usually the same number as sepals) in the inner whorl. Examples: left, a 4×4 polymerous bloom, on right, the rarer 5×5 polymerous bloom. 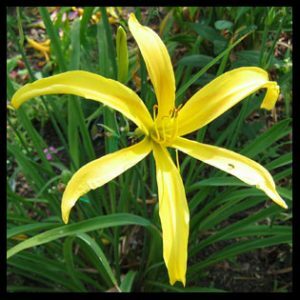 Multiform: This term is used where the daylily in question has been registered correctly as exhibiting 2 or more of the forms spider, unusual form, polymerous, or double.” An example of a multiform is a daylily that is both a spider and an unusual form, or a polymerous double, etc, but a single spider, etc. is not a multi-form. Sebastian The Crab (Joiner-J. 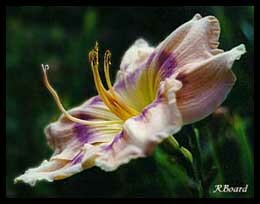 2003) is registered as a Double & an Unusual Form. Sculpted: A term used to describe three-dimensional structural features involving or emanating from the throat, midrib or elsewhere on the petal surfaces. Sculpted forms belong to one of three different groups: Pleated, Cristate and Relief. These form characteristics are collected on the current registration form but are not currently recognized for exhibition purposes. 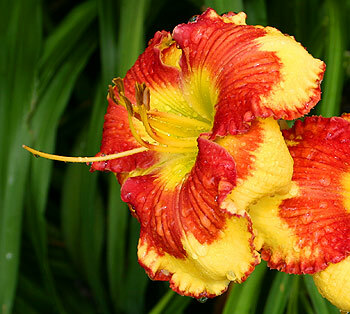 Circular: When viewed from the front of a bloom, the flower appears round. Segments tend to be short, wide and stubby, and generally overlap, giving a full appearance. Flat: When viewed from the side of a bloom, flowers are perfectly flat except for the concave throat. Informal: When viewed from front of bloom, flower segments have no definable shape. Segment placement may be irregular, widely spaced or floppy. 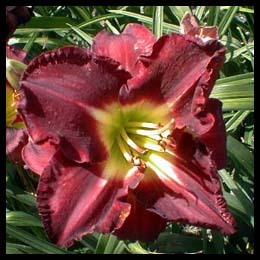 Recurved: When viewed from the side of a bloom, flower segments flare, but the ends of some segments roll back or tuck under. When the sepals are all recurved, and the petals are not, the result is a triangular form, when both sepals and petals recurve, the result is often the round form. 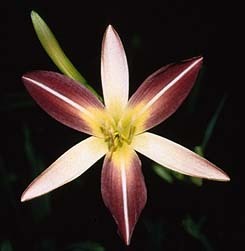 Star: When viewed from front of bloom, flower segments tend to be long and pointed. There is space between the segments, and the shape looks like a three-pointed or six pointed star. 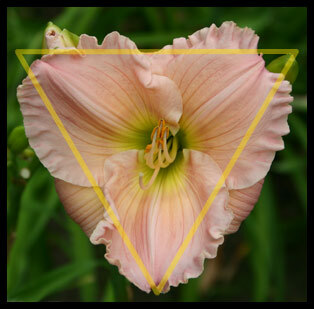 Triangular: When viewed from the front of the bloom, the flower segments form a triangle. 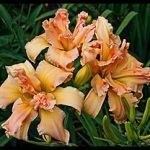 The sepals generally recurve. 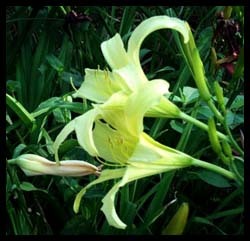 Trumpet — When viewed from side of bloom, flower form resembles a true lily. Segments rise from throat in an upward fashion with little flare.